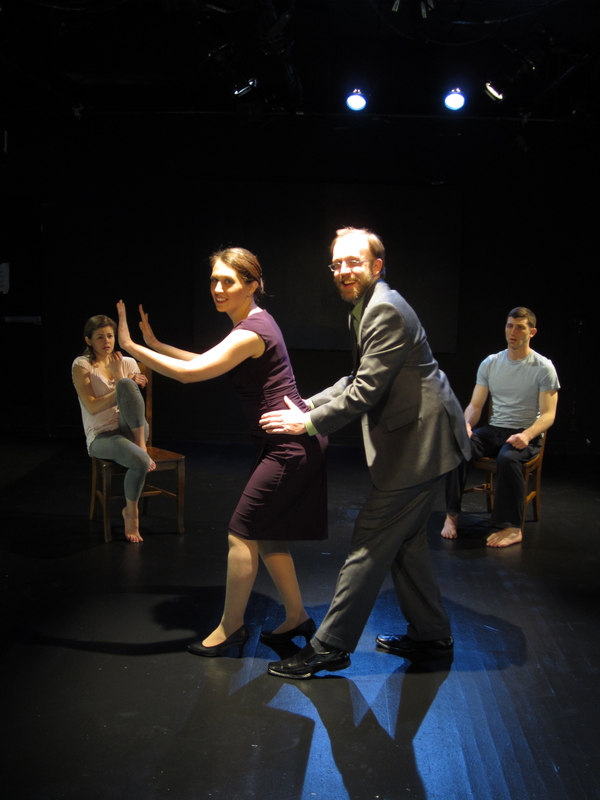 (Boston, MA) Innocence and responsibility intertwine with reality and absurdity in Exquisite Corps Theatre’s production of The Play About The Baby. A young couple, known only as boy and girl, explore their relationship as they bring new life into the world. Through wicked twists and turns the couple spend their time trying to be intimate while they are constantly interrupted, first by the baby and then by a man and woman who act as a cross between social anthropologists and time-share sales people (although no time-shares were sold in the making of this play).This play is not a comedy for the masses, but it provides shock and entertainment for those who like black comedy and those who like to think. The girl (Lynn R. Guerra) has her baby at the beginning of the play (how’s that for truth in advertising?). Both the girl and the boy (Zachary Eisenstat) are young and seem less concerned about the baby than their own self-gratification. At first, the man (Bob Mussett) enters when the young couple is off and begins to discuss theories of reality. After another scene, the woman (Janelle Mills) comes in and talks about her youthful excursions. All of this, while strange, seems reasonable in the course of the action–and it’s an Albee play, so no one should be expecting “normal.” But, that begins to change as the man and woman enter the boy and girl’s world and play mind games with them. By the end of the first act, reality has been cracked to the point that we don’t know whether the first act was an elaborate lie or dream or whether the man and the woman are some demonic force. Lynn A. Guerra, as the girl, steals the show and hearts with her playful and delicate performance. Throughout the play, Guerra is completely present both physically and emotionally and makes the illusions seem real. Zachary Eisenstat complements her performance by allowing the boy to be an immature male not ready for an adult relationship let alone a baby. If you appreciate dark, subtle comedies you should not miss this show. It leaves the audience both in a disquiet and pensive state. This wicked little comedy can turn your world upside down. This entry was posted in Comedy and tagged 2012, absurdism, black comedy, Bob Mussett, cruelty, Edward Albee, Exquisite Corps Theatre, Factory Theatre, Janelle Mills, Lynn R. Guerra, March, reality, responsibility, The Play About The Baby, Zachary Eisenstat by beccackidwell. Bookmark the permalink.